This post is a collation of budget-friendly ideas to cover open shelves for storage in your home and hide the clutter. Summer is the time when a lot of families in transferable jobs move before the next school session starts. Someone reached out to me on Facebook asking for suggestions of how to hide open shelves in a rental home. When I thought hard, I realized, this was not an isolated issue to just rental homes. People in permanent homes face this issue, too. As I’m writing this post, I look straight into a rack of open shelves beneath our staircase that is a sea of clutter with everything from old newspapers to tool box and extra gifts. Lesser said about the mess, the better. No, I’m not going to share a picture of it. The simpler way out would have been to install a door to conceal the eyesore, as everyone around did. But, being a tight space, we felt a door would constrain movement and our ability to access things inside. I know, what were we thinking! In short, we all have our reasons for open shelving: lack of space, budget, rental home, or just plain enamored by the beauty of open shelves. Our jobs require us to move every two years. These are houses in government quarters that we make homes and part in a short span of two years. So we try to make the best in least time and the least budget. Can you suggest ideas how to idea open concrete shelves and at the same time be able to use it? Making a cupboard is an expensive deal for us. From my personal experience of having lived in such houses for decades, I can tell you that you will be amazed at the vibrant decor you see around. And, let’s not even talk about the multi-purpose usage. 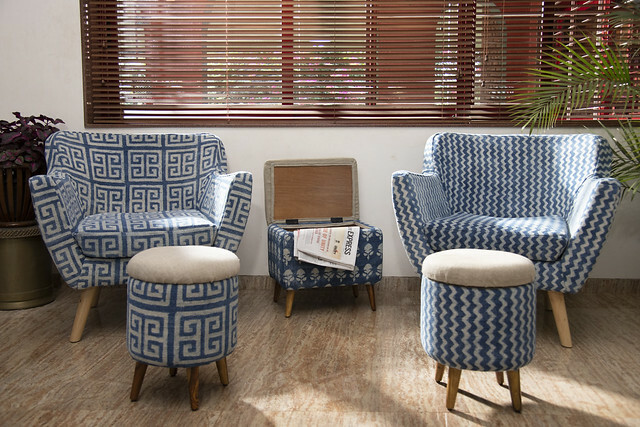 Long before steel trunks become an artifact in modern homes, people used it for storage and covered it with hand woven textiles for seating in living rooms. So, back to the question, there are two straight forward budget-friendly ways to hide the clutter in open shelves. In this case, she was going to use the shelves as a closet. The simpler solution is to hang curtains in front of the shelves. You can let your imagination run wild by going with a fabric and colour of your choice from sheer to printed. Install a curtain rod and hang ready made door curtains. The cost should be no more than Rs.1500 for this. Here are a few ideas to tickle your imagination. If you are being a little adventurous, you can even try bamboo blinds. The only disadvantage is that it will be a little cumbersome to use it. The second fancier and slightly expensive option is to install sliding doors. There are a number of mechanisms available from doors hanging only only by an arrangement at the top to a sliding mechanism with balls on the lower rack. You can choose one that fits your budget. Going with branded slider mechanism like Hetitch or Ebco will ensure longevity. Again, in these, you have a number of options that will suit your budget.